WHAT ARE HTCRP AND MTCRP? 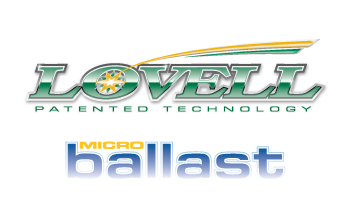 The Microballast replaces conventional wire and electronic ballasts at a fraction of the cost. The Microballast results in true “Instant Start” capability with lightweight fixtures – no heavy ballasts needed. The Microballast extends bulb life dramatically. Use of the Microballast results in significant energy savings versus current fluorescent installations. The Microballast emits no electromagnetic interference (functioning at a low 120Hz). The Microballast has zero or near-zero harmonic distortion. Some Microballast designs can be integrated directly into the bulb itself. Microballast designs can operate below 32°F and are the most compact “Instant Start” lights available. The Microballast is cheaper to manufacture, low-profile, and works on both 120 and 220 VAC. 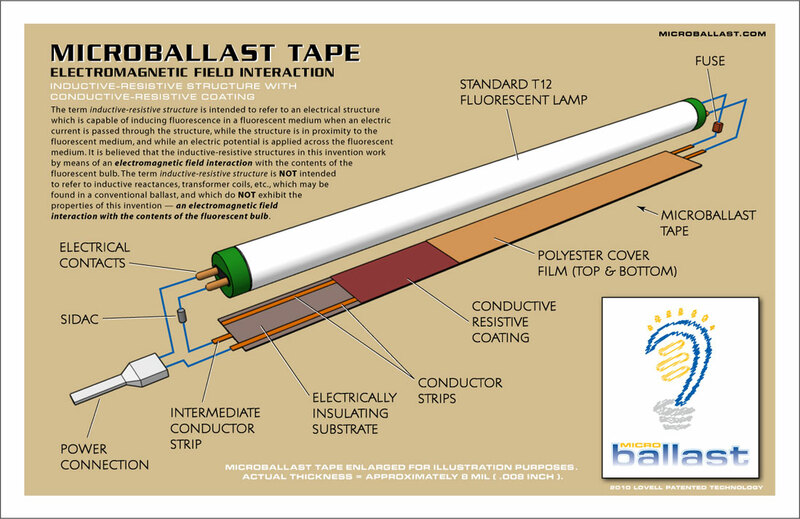 The Microballast is a conductive-resistive tape that simply and efficiently fires any fluorescent lamp. An alternative embodiment consists of a fine micro-wire that is taped, bonded, or extruded to the bulb on its inner or outer surface. Imagine a fluorescent ballast as thin as a piece of tape. And as with any traditional electronic ballast, it both ignites and regulates current flow to the fluorescent lamp. Yet its form factor is so small and its constituent components so inexpensive that you wonder why no one had thought of it before. Click on the graphic to view a larger version. The Microballast tape illuminates by creating a gentle electromagnetic field interaction, exciting electrons along the length of the bulb and regulating current flow – using minimum energy and without the need of any traditional ballast. This method of lamp ignition is exceedingly kind to the bulb components, resulting in significantly increased lamp life. Instead of a self-contained box filled with circuitry and hidden somewhere in the traditional fixture, imagine the "ballast" integrated into the lamp itself so as to be virtually unseen. Picture a T5 or a T8 bulb with a thin strip of tape bonded to its outer surface and a simple power cord feeding it from only one end. Evolve the concept even further and envision a fine micro-wire bonded to the inner surface of the lamp during the manufacturing process – effectively placing the "ballast" inside the bulb – and you begin to realize the potential of the Microballast.